Small, portable electronics are one of the best sources of recyclable and reusable materials that people end up just throwing away. Portable electronics contain a wealth of rare metals and recyclable materials which should be disposed of in an ethical, thorough, efficient and productive way. 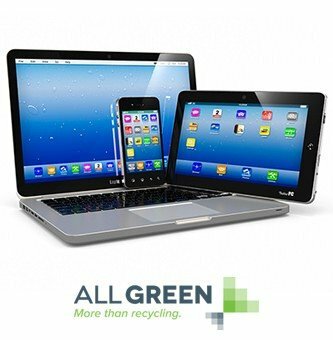 At All Green Electronics Recycling, we make recycling your portable electronics very simple – we’ll pick them up or you can drop them off. We will ensure that your electronics are then recycled and/or repurposed in the most sensible way possible, putting each and every part to its best use. We are experts in the field of recycling. Beyond harvesting precious metals from outdated equipment, our process relies on repurposing and remarketing. Part of our service is to create an ITAD strategy that will lower cost and reduce impact on the environment. This is not a generic process which you buy into. We create a custom plan for you and your equipment, optimized to maximize return for your recycling efforts. This maximizes the return on revenue, while maintaining the highest safety, security, and economic standards. We deliberately make the responsibility of equipment recycling easier. Our systems allow you to track your equipment through your customized process. With the largest fleet of IT recycling trucks in North America, you can see how our system makes recycling so efficient that it’s better for us to come to you. Our pickup system does not increase cost, it reduces it. As part of a whole system approach, the benefit to you is decreased time handling recycled equipment, and greater ease doing do. Our first approach is to meet the R1 Responsible Recycling ISO 14001 Standard. Our total approach is to exceed it. We act as a further gateway for your data security. We understand that you don’t let archived data and extraneous data on recycled equipment out the door. But we data sanitize every piece of equipment to ensure that our customers never have to worry about lost data, sensitive documents, and contractual security obligations. We offer and build trust, because we understand that information is your most valuable asset. Every piece of equipment which passes through our door receives state of the art data wiping treatment. With new data security and equipment disposal laws, it only makes sense that obligatory processes are profitable for you. At the same time, your clients and staff should understand your commitment to legal adherence and environmental security. Our process eliminates risk, offers you bragging rights for efficient and thorough recycling, and brings convenience and maximized return for your efforts. Avoid crippling fines and sanctions, and reap the benefits of environmental consciousness. Sustainability is a business asset, not a cost. We make sure that remains the case for you. We are all living in a digital age where much of our survival depends on various forms of technology. From the time we get up until the time we sleep, we depend on technology in many ways for our survival. This has happened at an incredible pace, catching the entire world off guard. Buying a piece of technology is a breeze these days through easy methods of access such as online shopping etc. But when it comes to recycling these devices, we get lazy. The devices are just thrown away without thinking of the consequences. This trend must change; there simply aren’t enough resources in the world to keep it up. 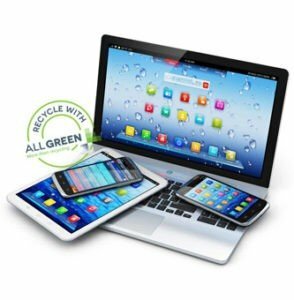 If an electronic device contains batteries or precious metals – and this includes the majority of portable electronic items today – they cannot be simply thrown away into the trash. Doing so leads to severe degradation of our environment, which leads to huge issues like global warming. In fact, portable electronic devices are becoming one of the major issues of recycling, as they are easier to hide and throw away with the daily trash than larger ticket items. There is a certain physiological effect where we assume that since the item is smaller we are doing no damage to the environment if we do not dispose of them ethically and responsibly. Nothing could be further from the truth. Portable electronics have increased rapidly in recent years, leading to huge advantages in many areas of our day to day life. But these portable electronics devices, just like larger electronic devices, must be recycled properly to avoid any serious environmental hazards. It is also a terrible waste of natural resources to just throw these items on a tip, as they contain rare metals that we spend a fortune mining from the earth to get in the first place. There are two primary ways of recycling portable electronic devices. The first way involves calling All Green Electronics Recycling, and we will come directly to your home and collect the device. The second way involves dropping off the portable electric devices at our pickup locations. Our technicians analyze the devices; if user data could be present, it will be removed completely using state of the art tools. Any useful components are collected and saved, and precious metals are harvested. We complete this process with the environment in mind throughout all stages. Ultimately, the portable electronic device is re-used, recycled, or repaired.